The Dordogne contains some of the prettiest villages of France and a good number of them are concentrated around Domme. France is full of gorgeous villages and to make sure you see the best of them there is a "most beautiful village" label given to the prettiest 156. Of these 10 are in the Dordogne department, more than any other single department apart from Aveyron which also has 10. Domme is one of the ten and three others are less than 10km away putting Domme at the heart of a very beautiful part of the world. Read our insider's guide to a day to spend near Domme. Domme is quite a large village and has a selection of hotels, restaurants, camp-sites, bed and breakfasts etc making it a good base for exploring this part of the Dordogne. 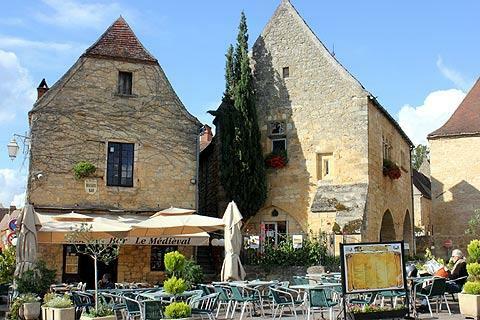 Domme is a medieval bastide town built on a grid-like pattern with its main square at the centre. Surrounding the bastide there remain parts of the defensive walls and three of the large stone gateways. One of these once served as a prison for Knights Templars and still has some of their 'graffiti' carved into its walls. As an added bonus Domme has a huge cave underneath the central square. This has a great display of stalactites and stalagmites. Domme also has some fantastic views over the Dordogne river and valley below. 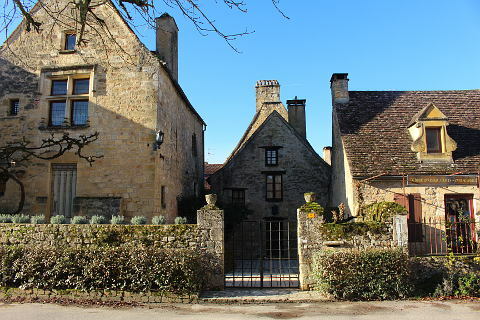 No trip to the Perigord noir would be complete without sampling some of the regional specialities such as Foie gras and Confit de Canard both of which can be found in the Maison Lembard, a local producer who has been operating for four generations. On the other side of the river Dordogne is La Roque Gageac, another most beautiful village but with a completely different flavour. Whereas Domme sat at the top of a cliff commanding views over the Dordogne, Domme climbs up the hillside from a riverside location. By the river you can hire canoes or take a trip in one of the river-boats called Gabarres. As you walk up the narrow cobbled streets of La Roque Gageac you will notice the incredible exotic planting all along the edges of the path. La Roque Gageac has a number of lovely restaurants or if you prefer pack a picnic and head for the picnic benches near the car park. Here you can have your picnic whilst admiring the wonderful setting of La Roque Gageac with the river below and steep, overhanging cliffs above. After lunch head along the river to Castelnaud-la-Chappelle, recently added to the list of "most beautiful villages". Castelnaud-la-Chapelle is a tiny village completely dominated by the magnificent Chateau-de-Castelnaud which sits at the top of the village. This is a great museum and it has a wonderful display of medieval weaponry including full size reproductions of some of the large weapons used to defend the castle. If you are regretting not having gone canoeing at La Roque Gageac then you have another chance to hire canoes here, by the river below the village of Castelnaud. 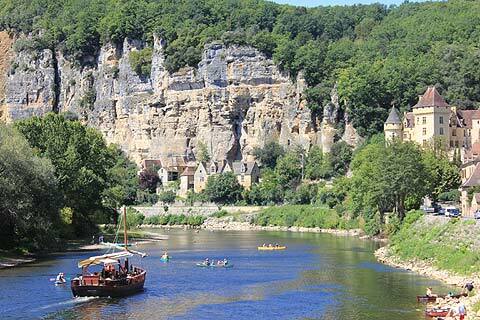 On the opposite bank of the river is the beautiful village of Beynac. This is another village that has grown up around a large chateau occupying a strategic, clifftop position. A bit bigger than Castelnaud the village streets are lined with interesting boutiques and ice-cream shops - plenty to keep you motivated as the streets climb steeply upwards. Beynac Chateau itself offers an interesting glimpse into life in a medieval chateau and also has some incredible views over the river below. 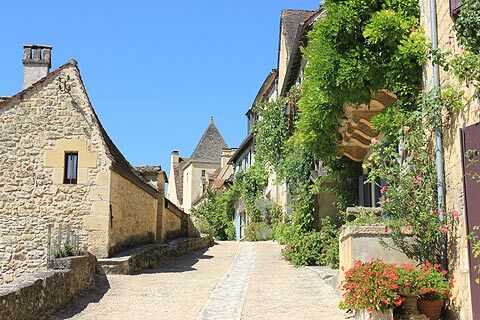 There are another 6 "most beautiful villages" to see and of these Limeuil to the west and Monpazier and Belves to the south are within striking distance. To the north Saint Leon sur Vezere and Saint Amand de Coly are both not too far. If you have children then the castles at Castelnaud la Chapelle and Beynac should prove entertaining for them. Especially Castelnaud with its warfare museum and demonstrations of its large reproduction machines of warfare. Canoing is always very popular with children, or if you wish to laze on a river beach then head west to the "most beautiful village" of Limeuil which has an excellent river beach and is a very popular spot for sunbathing, paddling and swimming. The Jardins of Marqueyssac are very close to Castelnaud and as well as being amazing to look at with all their swirling clipped box hedging they have a lovely walk along the cliff top with views over the river and a good children's area and picnic area. It always seems to be a hit with children. 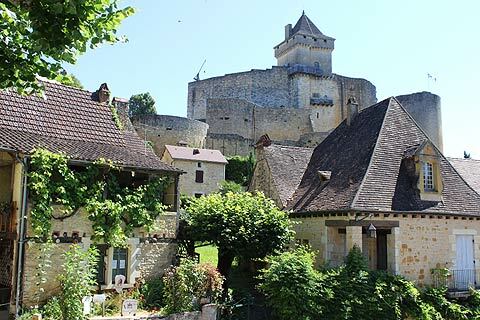 If its raining you can spend time indoors visiting the castles of Castelnaud, Beynac or the nearby castle of Les Milandes. If there was a category for "most beautiful towns of France" Sarlat would definitely be in the top 10. It has enough boutiques and cafés and bars to keep you out of the rain if the weather turns wet. Be sure to go into the Maison de Gisson too. Top of your list should be a visit to one or more of the region's famous prehistoric sites. A day around Les Eyies will give you a great introduction to prehistoric Dordogne.